Many golfers stress about proper swing plane, proper position at the top, the downswing, et cetera. However each of these components of the swing are predicated on the beginning of the back swing. The means or direction by which the back swing is initiated can and will influence the rest of the golf swing all the way thru the impact position and quite often the follow through (or lack there of). The important thing is to make full use of your larger muscles to begin the back swing, instead of pulling the club with your hands, inside the target line or basically just lifting your arms up. The golf take away is perhaps the most integral components of your golf swing. In the majority of circumstances, the first two feet of your back swing determine the swing path the head of the club will trek thru impact. The mistake that is most common among amateurs is beginning their take away from a closed set up position. This causes the club head to get “stuck” behind you, leaving you no other alternative but to cast the club (coming over the top). Now you’ll be cutting across the golf ball generating the least desirable ball flight…the pull fade. On the flip side, positioning yourself with a closed golf stance to promote more of a draw on the ball is often times a “band aid”. An inside take away with a closed set up position is really fairly simple and can feel 100 % natural the first time someone tries it. It’s not very often you find a professional with a golf stance with his/her feet pointed more than a few yards to the right of the intended target (left for you south paws). However somehow, somewhere along the line golfers still hear it or read it someplace that merely closing your set up position will help promote a draw of the golf ball. In some instances this “might” be true, but many times positioning with a closed position causes a pulling of the golf ball to ensure it flies in the direction of the particular target area. The “pull” is an outside to inside swing path, this creates a slice or even a fade of the ball when he face of the club remains open at impact. To generate a draw the swing path of the golf club needs to begin from the inside to outside from the top thru the point of impact. Get shaft of the club parallel to the ground while still below your waist. Your club shaft should also run parallel to your target line. Golfers initially may fear or not like the feel or the aesthetics of this positioning, however, you can not argue with the results. Try to embrace that proper mechanics in golf feels very different or even feels weird at first. This is reason playing golf is so challenging. We, as human beings get pleasure from instantaneous gratification and immediate outcomes. If playing golf was easy… wouldn’t everyone be a tour pro? As I said earlier, the important thing is to make full use of your larger muscles to begin the back swing. Here is a great video to help you better understand what that means. Golf Lessons: This years winner of The Masters, Adam Scott displays a technique in his picture perfect golf swing that is virtually flawless. His golf swing is often compared to Tiger Woods’ golf swing…many times, both swings look very comparable. The comparisons begin with their physical fitness levels. Adam Scott and Tiger have both taken golf health and fitness to the next level. Neither Adam Scott nor Tiger Woods have any apparent physical restrictions that impacts their swings and their technique…which is very atypical. Most golfers, amateur and professional, have a certain amount of restriction whether it be their lack of strength or their overall lack of flexibility that finds its way into their swing. Scott has fantastic posture as he keeps a perfect spine angle at address and during his swing. As a matter of fact, Tiger Woods’ swing is a bit less efficient than Scott’s, but he (Scott) for the most part does not have Tiger’s short game ability nor his mental resilience that has given him, (Tiger) the number of PGA wins and Major Tournament victories that Adam Scott will never get close to. However, We admire and praise Scott for his strength of character with his golf game training, and we expect him to win more tournaments and possibly another Major as his career continues. With a virtually perfect golf swing, all he really needs is to continue putting and chipping around the greens like he did at the 2013 Masters Tournament in Augusta. His driving distance and accuracy are close to the top of the stat sheets on the PGA tour every year, so there is not much room for enhancement in those areas. Scott says he will keep working with his golf training regimen which will invariably give him an advantage with respect to power and consistency through out any golf event and the rest of his career. His short game and mental toughness are two of the few areas Scott will need to stay focused on. But as we said, his posture, spine angle and golf swing are nearly perfect. Every golfer should try to replicate Adam Scott’s address and golf swing. Golf Lesson: Why do they call it Amen Corner? The Masters: Back in 1958, Herbert Warren Wind wrote an essay for Sports Illustrated regarding The Masters where he introduced the golf world to the phrase “Amen Corner”. Since then, the original spirit and intent of the expression has been obscured. Attendees like to say that there is nothing else, anywhere in the world like “Amen Corner”. This has a lot to do with the phrase coined by Wind. He was both humbled and embarrassed by this distinction. He never though he was stating some thing underived concerning The Masters. Wind attempted to dump the audience right in the thick of the experience and to stimulate the readers as best he could. He tried to take hold of his readers and keep them. He enjoyed his own use of wordplay, and this is where “Amen Corner” originated. The phrase comes from a jazz recording that Wind liked. He cited it in the his opening paragraph, and it was so inadvertent that he never even bothered to describe the musical meaning. Wind never even mentioned the tournament winner – Arnold Palmer – until he was about 400 words deep into his essay. His classic writing skills led Augusta National to memorialize him by naming the press room in the club house after him. “Amen Corner” never referred to some hallowed ground. It was originally a reference to the second shot on the 11th hole, the par-three 12th hole and the tee shot on the 13th. It was that angle of the golf course that forced the players to breathe a sigh of relief after surviving that part of the course. Years later, people began to remember it incorrectly. Amen Corner later turned into all three of those holes in their entirety. It was easier this way, rather than describing the phrase so specifically. Unfortunately, this how history remembers things. Creations become simplified and changed. The intended nuance is disregarded. 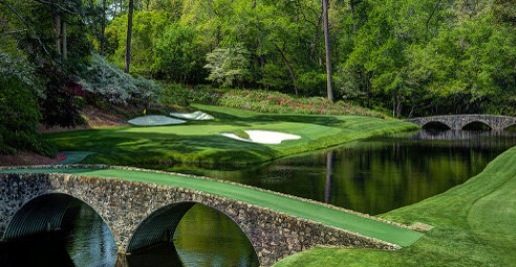 In any event, “Amen Corner” is a huge part of the magic and pageantry that surrounds The Masters and the quest for the green jacket. The 30 yard pitch shot can be one of the most difficult shots approaching the green. Often times this shot demands a forced carry over a hazard or very challenging pin placement. A 30 yard pitch shot is also quite challenging since it is generally performed from a seldom practiced distance. Yet, in spite of the obstacles, from this distance you should be thinking about knocking the ball close and getting up and down. Understanding how to cope with this gap is essential for a successful shot. Here are a couple of drills that will help you cultivate sharper distance control around the greens. This exercise will assist you in learning the proper feel and follow-thru of your stroke. As the phrase implies, you will not require a golf club to complete this exercise. Choose a a number of targets at a variety of distances. Face each target and make an underhand toss with a golf ball at each target. The underhanded throw should be executed with your strong or trail hand in your golf swing. Feel the relaxing sensation in your arm and body whilst making the pitch. Secondly, notice the way your arm finishes higher and higher as the intended targets move further away from you. Right after a handful of tosses grab a wedge and replicate the gradual progression until you lock in to that 30 yard target. This is my own personal swing thought on the golf course. Think about matching the length of your swing to a specific yardage, in this case, 30 yards. Understanding just how to follow thru is imperative to effectively hitting a 30 yard pitch shot. Many golfers generate a substantial back swing and slow down thru impact with a tight and restricted follow thru. To cultivate the most effective finish, you must fixate on a reduced back swing and a more lengthy follow thru. Golf Quick Fix: Consider that your swing is comparable to the hands on a clock. For instance, if you swing your arms to a 9 o’clock back swing position and follow thru to the 3 o’clock positioning…evaluate just how far the golf ball travels. Swing with a consistent tempo and follow-thru and adjust your swing as needed from three and nine o’clock to lock in that 30 yard pitch shot. For me those swing lengths work perfectly with my pitching wedge. But use the golf club that makes the 30 yard pitch shot one of your “go to” shots. As a golfer, you need to embrace the concept that the only option you have to improve upon your pitch shots is through practice. You have heard it before, “repetition reinforces retention”. This has never been more true than with the short game in golf. Practice is the truest Quick Fix Golf lesson. That being said, set some targets at various distances and rehearse your pitch shots. Determine your “go to” distance or distances. A simple and easy approach is to establish some short range targets and work your way further down range. Cultivate the feel by taking repeated golf swings that you will be able to bring to the golf course. For years the thought of landing in a sand trap filled with wet packed down sand was one of my greatest fears on the golf course. There was no need for it. There are now times that I find the wet sand is a little more manageable for me, depending on the height of the trap. Now that I understand how simple the technique is, it is no longer a great concern of mine. I am not trying to downplay landing in the bunker. There is a good reason they call the sand bunker a hazard. You can come across a wide variety of of lies in the sand trap. Each of them can require a somewhat unique strategy. Some golf courses have a light and fluffy sand in there bunkers however the course a mile away might have sand traps loaded with a very heavy and course type of sand. Some bunkers have heaps of sand while the others will only have a thinner covering. All that being said if the bunkers are wet due to rain or in the path of a rotating sprinkler, you are working with another factor all together. The powers that be in golf do not permit you to tryout the texture of a sand trap with a golf club, so you will have to depend on your feet to deliver any feedback regarding the depth of the sand, the texture and the consistency. Your sand wedge typically has a particular amount of bounce. The bounce is found on the sole of the golf club head. The bounce provides the ” lift ” required to burst the golf ball out of the bunker under regular or dry conditions. In cases when the sand is flattened by dampness, the bounce that assisted you to hit the golf ball out of the dried out sand can lead you to blade or skull the golf ball…hitting it thin from wet sand. If you are in green side bunker, you should consider using a lob wedge. A lob wedge has more loft but does not have as much bounce. If you do not have a lob wedge, try a few practice shots with your pitching wedge, it also has less bounce. The approach from wet sand is not quite the same as from dry sand. Utilizing this approach, the golf ball will come out a little hotter and fly a bit further than a typical sand shot. Open your stance, however not as much as with a standard sand shot. Open the face of the club, but not as much as in typical conditions. Keep most of your body weight on your lead foot. Shorten your back swing. You will not want to strike as far behind the golf ball as you would if the sand was dry. Swing the wedge a tiny bit harder than normal. It is vital that you follow through or the ball may stay in the trap. When executed correctly you will hear a ” thump ” when the sole of the club hits the sand. Listen for the ” thump ” when you rehearse this shot. Your short sticks are your scoring clubs. And this is one of the shots you need to have in your bag. If you don’t have one, think about getting a lob wedge.